One out of every eight infants in the United States is born prematurely each year. Preterm-related causes of death account for about thirty-five percent of all infant deaths, more than any other single cause. Babies born too soon have to fight for their survival and the odds are not in their favor. Meghan Sheriff of Glen Allen is an elementary school teacher in Hanover County who owns and operates a tutoring business. Six years ago, she was delighted when she discovered she was carrying twins, but stunned when her obstetrician told her this news: The fetuses had twin transfusion syndrome, a disorder that means they share the same placenta and have some connected blood vessels. Meghan was put on bed rest with a fetal monitor. At twenty-five weeks, laparoscopic in-utero fetal surgery was performed. The surgery was successful in separating the twins. “I was so happy when there were still two heartbeats!” Meghan recalls. However, a week later, in her twenty-sixth week of pregnancy, her water broke. developed organs of the infant. NICUs are places of drama, with victories for some and heartbreaking loss for others. Babies born at twenty-five weeks have only a fifty percent chance of survival. Meghan’s twins were only a week older. We often think of premature birth as a matter of birth weight, but it is more complex than that. Premature birth is when a baby is born earlier than thirty-seven weeks of gestational age. The milestone is an important one because at that age, the internal organs are often not developed enough for the baby to survive. Every week of pregnancy is important. For example, at thirty-two weeks, a baby’s lungs are still developing and may or may not be able to support his breathing, and because baby’s brain develops fastest at the end of the pregnancy, preterm birth means higher risk of neurological defects. “This was incredibly stressful. My babies were in the hospital, fighting for their lives,” says Meghan. While the babies struggled, Meghan, who also had a toddler, struggled with them. This is when she met Rebekah Rollins. Rebekah Rollins lives in the east end of Henrico. A bus driver for Henrico County, she has worked as a prison guard and was most recently employed as a deputy sheriff with the Richmond City Sheriff’s Office. Seven years ago, Rebekah was pregnant with her first child and seemed to be having a normal pregnancy. But suddenly, in her fifth month, her water broke. At St. Mary’s Hospital, she was given medication to forestall contractions and sent home with doctor’s orders for complete bed rest. But the next week, the baby’s twenty-fifth, the contractions began again. On March 29, 2008, her first child, Jeremiah was born, weighing only one pound and eight ounces. While most new mothers are somewhat nervous with their first child, Rebekah was terrified. “He was so small. There is a picture of him wearing my wedding ring around his wrist. That is how tiny he was!” She was scared to hold him. They told her his chances for survival were poor. “I was so glad the next morning that he was still alive.” The staff warned her about possible infections, head bleeds, handicaps, birth defects. On top of that, he was having trouble breathing. The nurses asked her about a do-not-resuscitate order, but her attitude was to fight for this tiny life. “I was not going to give up on him. I told them no, I wanted that baby to live.” Rebekah’s strong religious faith kept her going. Rebekah Rollins says she never knew what health challenges her son might be facing when she came to the St. Mary’s NICU each day. Jeremiah, like Matthew Sheriff, was born too soon and weighed just a pound-and-a-half at birth. The boys’ mothers bonded over their similar and scary circumstances. Both mothers came to the hospital every day for more than ten weeks, to hold their babies, feed them, and give them comfort. The nurses taught them “kangaroo-pouch therapy” which involved nestling the babies inside their clothes, skin to skin for several hours at a time. 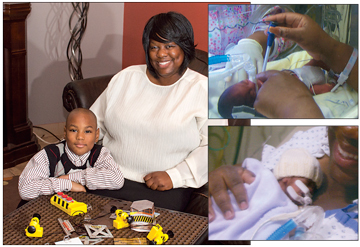 Matthew Sheriff, shown with his mom, was born at twenty-six weeks at St. Mary’s Hospital. 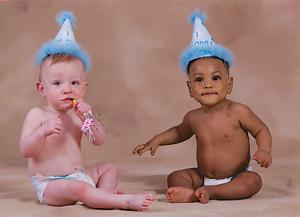 Below, he and preemie buddy Jeremiah celebrate their first birthdays. Dr. Davis adds that while most people with preterm labor have no prior history, there are risk factors. The most important is having a previous history of preterm labor. In addition, multiple gestation, (carrying twins, triplets, etc. ), being either under eighteen years of age or over thirty-five, genital or urinary tract infections, African American ethnicity, and certain medical conditions, like diabetes, all increase risk of premature labor and birth. An important breakthrough treatment for prevention in patients with a previous preterm birth is a course of weekly progesterone shots during weeks sixteen to thirty-six. Both Rebekah and Meghan needed all the support they could while visiting the NICU at St. Mary’s Hospital each day for many months, but they needed even more help after bringing their babies home. Taking care of a preemie can be daunting since they are at constant risk for infections and may need the help of multiple therapists to develop normally. Both said their families and their churches helped make it happen. Meghan and Rebekah continued their relationship of mutual support and sharing after bringing their babies home. 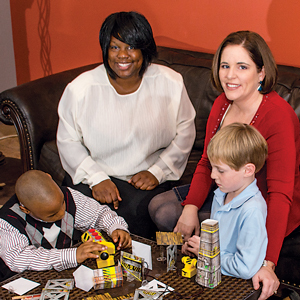 Both Rebekah’s and Meghan’s sons experienced some developmental delays as a result of their premature births. 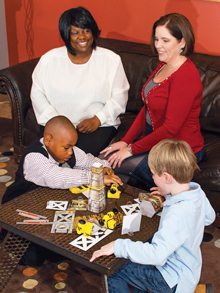 Both boys received eating, speech, and occupational therapies, and both have overcome those delays. Matt is a healthy kid and a typical first grader. Unrelated to being born preterm, Jeremiah was diagnosed with autism later and is currently enrolled in an applied behavioral analysis therapy program. So while premature birth can be dangerous and difficult, these tiny babies can survive with no lasting damage. Having cerclage during each of her subsequent pregnancy, Rebekah has safely delivered three other children, ages, four, two and three months. Meghan expanded her family with a fourth son two years later. What is Kangaroo Pouch Care? In Bogata, Colombia, in the eighties, the rate of mortality for premature infants was seventy percent. In an effort to change this, doctors instituted a program of care in which mothers held their babies all day, tucked under their clothing, with direct contact with the mother’s skin, similar to how a kangaroo carries its baby in a pouch. Mothers even slept with their infants at night. The results were dramatic. Mortality rates sank and babies who experienced “kangaroo pouch care” were thriving and able to go home much earlier than those who did not. Studies have shown conclusively that skin-to-skin holding in infants stabilizes heart and respiratory rates, improves oxygen saturation rates, better regulates an infant’s body temperature, and conserves a baby’s calories. When a mother is “kangarooing,” the infant typically snuggles into the breast and falls asleep within a few minutes. Remarkably, the breasts themselves have been shown to change in temperature to accommodate a baby’s changing temperature needs. The breast can increase in temperature when the infant’s body is cool and can decrease in temperature as the baby is warmed. The extra sleep that the infant gets from these ideal conditions helps the baby conserve energy and redirects calorie expenditures toward growth and weight gain. Being in close contact with the mother helps to stabilize the infant’s respiratory and heart rates. Brain development was another area of improved development. Brain-wave patterns of infants in kangaroo care showed two significant things. First, there was a doubling of alpha waves – the brain-wave pattern associated with contentment and bliss. Second, they found that “delta brushes” were occurring. Delta brushes happen only when new synapses are being formed. So holding the infant skin-to-skin allows his or her brain to continue its important work of developing neural synapses. This simple technique has saved thousands of preterm babies. Diane York is a Richmond-based freelancer, mother, and grandmother and regular contributor to RFM. She writes about lifestyle and wellness issues.